Honeywell HC26E1004 Humidifier Filter Pad with AgION™ Coating for models HE200, HE250, HE260, HE265, HE280, HE300, HE350, HE360, and HE365. Same as HC26A1008 but with a Antimicrobial coating. This item must be replaced at least once per year for optimal performance. 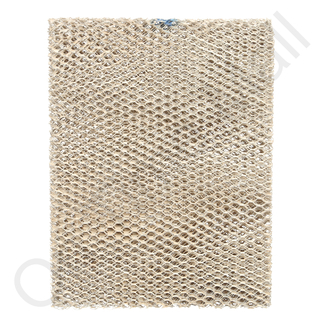 This item is sometimes called a water panel, media filter, evaporator pad or humidifier pad. This filter does the job. Just change every season. Both filters arrived in perfect condition. The company helped me determine which filter to pick (anti-bacterial) and the order was sent promptly. Nice company to order from. The part I received was exactly what I needed. Wish everyone could be as efficient. The shipping was prompt. What can I say? It fits and it seems to be working. That's all I ask. The pad slipped right in place, no worries, and my fingertips are not splitting, so maybe the humidity is right. The replacement filter for our humidifier was easy to identify and order. Delivery was prompt. Exactly what I needed and it comes with clear installation instructions on the package. I have bookmarked this site and will buy from them again. The element fit into my humidifier. It was easy to install. I will buy more in the future. Having had them in the past---they work fine for a time--then disintegrate. Calculated obsolescence ? I liked that instructions are right on the outside of the box. Perfect fit. Came in a reasonable time considering ordered over the holidays. The filter fits perfectly and the previous one I purchased lasted through the winter. There were no signs of mold which I experienced after purchasing a non-original replacement. Great service. Filter works as advertised. thank you for your prompt service, excellenta attention to detail. The filter is perfect, fits like the OEM, and the instructions for use, customer application were great. The order was taken promptly and received as promised. It was installed with no problems. PRODUCT WAS EASY TO FIND AND ORDER ON THE WEBSITE. I T ARRIVED AS PROMISED AND WAS EASY TO INSTALL. Ordering and replacing the humidifier filter was fast and easy. The new one increased the humidity in the house. Part was delivery quickly, had instructions to install, and was easy to install. It's working fine. The part is working great!!! I received excellent service during the purchase of my new HC26#1004 Humidifier Filter. Thank you for your prompt attention to my order. Easy to order. Parts catalog was easy to follow. High quality part. Instructions for removal of old one and insertion of new one simple. I am satisfied that I got a good filter for the price. I was very pleased with the quick response and delivery of my order. Note: I have no idea what you want in the "title box". If other customers have the same problem then it would be a good idea to give it a better description.